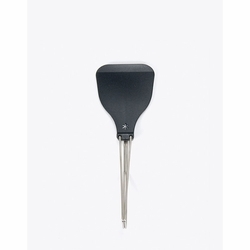 Snow Peak Collapsible Spatula/Turner. The Snow Peak Collapsible Spatula/Turner is made with a folding handle to easily fold up for compact storage at home or on the trail. A remix on the traditional cooking spatula makes for an ultra-compact and lightweight hiking utensil. Made of Nylon 66 to protect your non-stick cookware from scratches. Hand wash with a soft detergent and let dry before storing. Dimensions	L 6.5 x 2.7 x 1.1"